You’ve no doubt guessed that the Chesapeake Bay Retriever, or “Chessie” for short, originated in the Chesapeake Bay area of the United States. The Chessie’s roots go back 200 years... in the early 1800s, two New-foundland dogs were traveling on an English codfish ship when it sank. Fortunately, no lives were lost and the dogs ultimately found new homes on opposite sides of the bay. These two dogs were bred with the local retrievers, called spaniels by the local breeders, and three distinct types emerged: the otter dog, the curly coat and the straight coat. Over time, these three types were combined into the modern-day Chessie. The Chesapeake Bay Retriever is a sturdy medium-sized dog with a broad skull, strong jaws and a deep, wide chest. Males measure 23-26 inches at the shoulder and weigh 65-80 pounds. Females are smaller at 21-24 inches and 55-70 pounds. Their coat color is usually red, tan or brown. Though not a long coat, it is a double coat – the outer coat curly over the neck, back, shoulders and loin; the under coat wooly. The thick, oily quality of the coat prevents water from reaching the skin, and usually a cursory shake is all that’s needed after the dog emerges from a swim. If you’ve been lucky enough to see one of these dogs in the park, no doubt it was involved in an endless game of fetch. In fact, some Chessies have been known to retrieve upwards of 200 ducks and geese in a day’s work! While these dogs clearly display the qualities of a sporting dog, they are typically also very loyal to their people, often being protective of their human pack and indifferent to strangers. They are affectionate and gentle with children, but they can also be willful and stubborn, so they’re not generally recommended for novice owners. If these dogs are not socialized early and properly trained, they can develop territorial and dominance issues. 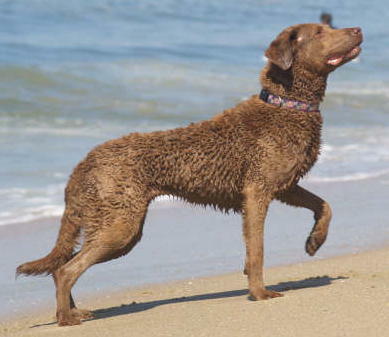 The Chessie is the consummate working/sporting dog and, as such, requires plenty of activity. A good-sized backyard is recommended, as these dogs may become bored and mischievous if not exercised adequately. In an urban environment, they will need special jobs and activities to keep them occupied. If yours is a family that’s active and on-the-go, then a Chessie may be just the dog for you!